An increase in biomedical research and advancements in science and semiconductor manufacturing have created the need for highly accurate microscopes. Measurements and magnifications are being made within microns and angstroms using atomic force, scanning probe, optical and electron microscopes. 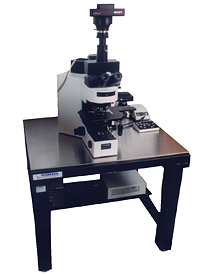 Due to the ultra-high resolution requirements, most of these microscopes are installed using PAL low frequency, pneumatic isolation systems which provide attenuation in laboratories and cleanrooms where human footfalls and structural vibration can otherwise decrease performance and accuracy. Biomedical research includes the manipulation of cells and the study of neurons and neural networks under magnification. Cell biologists and electro physiologists conducting cell injection, in-vitro, patch clamping and neuro analysis require a vibration-free environment that can be obtained using low frequency isolation.